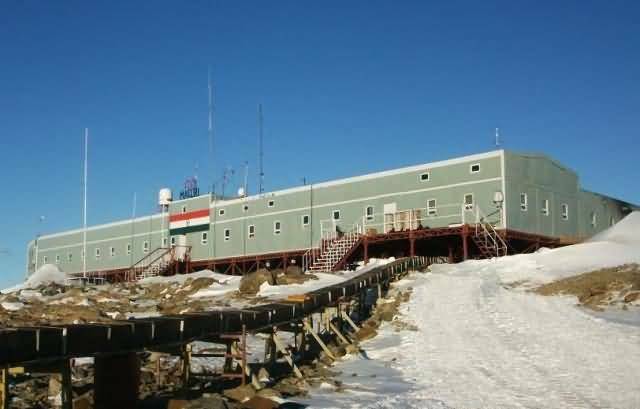 India's first research station in Antarctica was “Dakshin Gangotri” (1983) which has been decommissioned after it got buried under ice and has now been marked as an historic site. “Maitri”, the second Indian station has been hosting summer team of about 40 members and winter team of 25 members every year since 1988‐89. It is the gateway for Indian scientists to venture into interior Antarctic mountains. 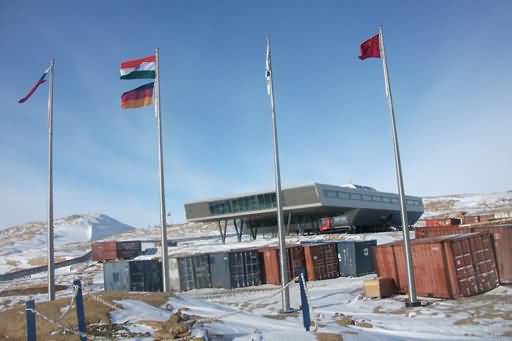 The newly built third station “Bharati” is situated at an unnamed promontory of land between the Strornes and Broknes peninsulas in the Larsemann Hills region of East Antarctica. The natural topography is a rocky granite hill towering approximately 90 meters above sea level. The placement of the new research station was based on a location that would minimise the amount of snow drifting, minimise the need for extensive site modification and provide the best access to the sea and sea ice. 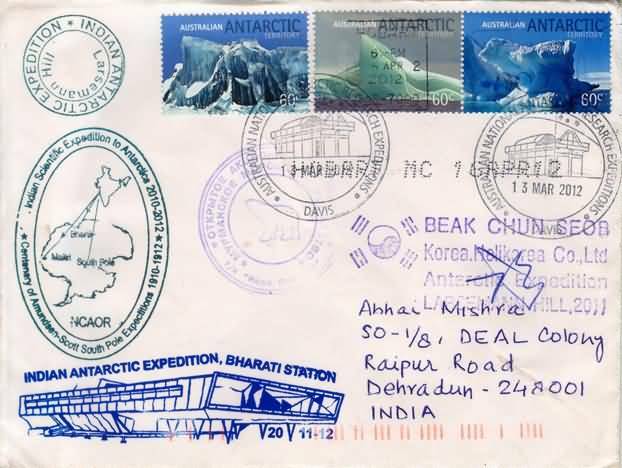 The new station is located almost 3,000 km away from the existing “Maitri” station which has been serving the nation since its inception in 1988-89.
cryosphere, which covers research activities at Antarctica, Arctic and glaciers of Himalayas. wintering team, Dr Rupesh M Das. The research station was opened on March 18, 2012 and at present 15 members are doing wintering in the newly built station. 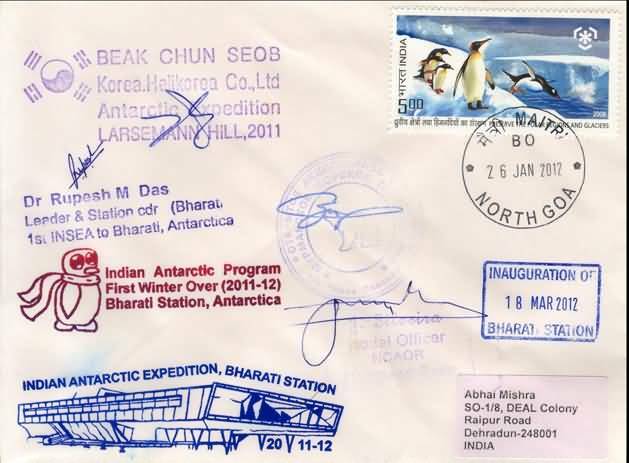 According to Rajesh Asthana, voyage leader of the expedition the research station would address the growing urge in the Indian scientific community for exploring deeper and wider areas of Antarctica for better understanding of the vast continent. 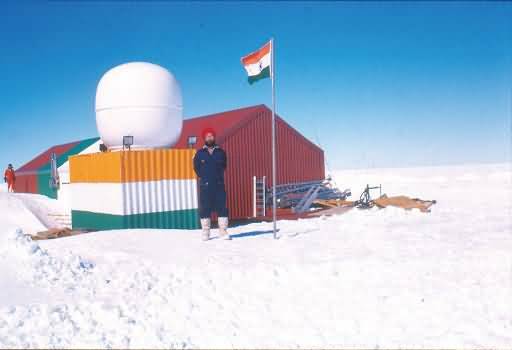 In fact India has done a soft launch of its third research station in Antarctica's Larsemann Hills region, considered as one of the few geological windows into the history of the continent. Bharati station and came to India via Hobart date stamped (18 Apr 2012). According to Shailesh Nayak, Secretary, Ministry of Earth Sciences, the station is being run on trial basis after the completion of its construction and the winter team is carrying out tests on various equipment and systems. The formal launch of the research station Bharati is expected in November when it is summer time in the icy continent. Antarctic and Ocean Research (NCAOR) is situated at Vasco, Goa only. NCAOR has been requested for having a post office at Bharati station also. It is hoped that the new station Bharati will also have a post office.